After a long deserved hiatus I have come back to my reviews. What a nice wine to entice me back. With the economy in disarray, we are all looking for a nice bottle of wine that won't break the bank. Look no further. This is your salvation. This wine is a blend of Tempranillo, Grenache, Mazuelo and Graciano grapes. Each year the percentage of each grape in this blend changes. 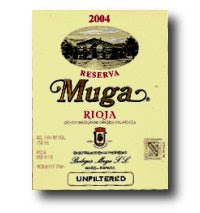 In 2004 it was about 70% Tempranillo, 20% Grenache and the balance a mix of Mazuelo and Graciano. This wine is consistently good from year to year. The winemaker has the latitude to change his blending percentage based upon harvest conditions and balance. For the past 5 years they have been perfect. This wine pours a dark ruby color. The nose is a mix of grilled bread, blackberry, cedar...almost reminiscent of a good California Cabernet. The wine is dense and chewy. Blackberry, mineral, chocolate and a bit of pencil lead lead to a long...surprisingly long.....finish. This wine has plenty of structure. The tannins are noticeable, but in balance. This one can last for 5-6 years in the cellar. I think this could use 30 to 45 minutes in a decanter to show at its best. This would be a winner with cheese or meats rich in fat. The pairing would enhance the tasting experience for both. I found this wine on-line for about $22 a bottle. I have had a good experience with Wine Library in New Jersey; http://www.winelibrary.com . They have reasonable shipping, and usually very competitive pricing. Don't hesitate to order from them. Wine Exchange in California is also a great vendor http://www.winex.com. They currently have half bottles at $12.99. If you can find this wine at this price it is a steal. Load up, and save some for a rainy day.